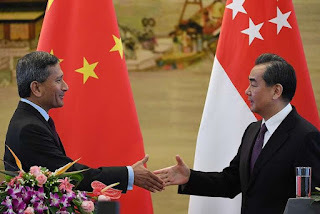 Singapore's Foreign Minister Vivian Balakrishnan said Singapore-China relations are in "good working order" and that both countries have agreed to work together on the Belt and Road Initiative (BRI). "(Ties are) very strong, based on a very solid foundation that goes back four decades," he said in Beijing yesterday. And there is also great potential to do more together, he added. "(The BRI) is a wonderful idea, and we have always been an early supporter of the initiative," he said at a joint press briefing with his Chinese counterpart Wang Yi. The first is a trade network that spans and interconnects China, Central Asia, Europe and South- east Asia. The second has to do with financial cooperation, which will see China leverage Singapore's strength as a regional financial centre to raise funds for the various BRI projects. Building the Belt and Road together will be the biggest highlight of our bilateral relations. China-Singapore relations are in good working order. They are strong, with the potential to grow even stronger. The third is in training and the transfer of technology. The two countries will work together to open up third markets in South- east Asia, South Asia and beyond, tapping the respective strengths of both countries. Mr Wang told reporters that China welcomes Singapore's support of and participation in the BRI. He noted that Singapore is well positioned to play an important role, given its unique strategic position. He was there in February for the 13th Joint Council for Bilateral Cooperation meeting. The council is a high-level platform for discussing ways to deepen and broaden Sino- Singapore cooperation. He was part of the delegation led by Deputy Prime Minister Teo Chee Hean. Dr Balakrishnan also called on Chinese Vice-President Li Yuanchao and State Councillor Yang Jiechi yesterday. National Development Minister Lawrence Wong attended the Belt and Road Forum in Beijing last month, and Minister for Culture, Community and Youth Grace Fu will be there later this week to discuss cultural cooperation. Last September, the nationalistic Global Times criticised Singapore diplomats for raising the South China Sea issue at a Non-Aligned Movement summit in Venezuela. This led to an exchange of letters between Singapore's Ambassador to China Stanley Loh and Mr Hu Xijin, editor of the Chinese Communist Party-linked paper. Mr Loh said the actions and words that were attributed to Singapore in the report were "false and unfounded". In November last year, the Hong Kong Customs authorities detained nine Singapore Armed Forces armoured vehicles on board a container ship that docked there. The vehicles were eventually returned to Singapore in February this year. Despite the improving ties, a Global Times editorial yesterday said Singapore "may not abandon its flip-flop diplomacy" as it faces "the difficulty of balancing between China and the US alongside Beijing's rise". "China needs to take a normal attitude towards Singapore swinging between the US and China," the newspaper suggested. Dr Balakrishnan has left for Manila, where he will meet Philippine Foreign Secretary Alan Peter Cayetano today.